A one night non-refundable deposit will be charged at the time of booking. There will be no refund for any cancellations or adjustment less than one week prior to arrival. For groups of 10 or more, the YMCA requires a deposit to hold the rooms. Full payment must be recieved at least 14 days prior to arrival or the reservation will be cancelled. The YMCA will only accept reservations that are booked for individual travlers on line. Group requests for 10 or more persosn must be directed to the Group Coordinator of the YMCA. Located steps away from Central Park and Lincoln Center, this New York Hostel features a 65,000 square-foot fitness center with a steam room, sauna, weight lifting/cardiovascular equipment and 2 indoor swimming pools. 100 Free group exercise classes, including yoga and Pilates, are offered to guests weekly. 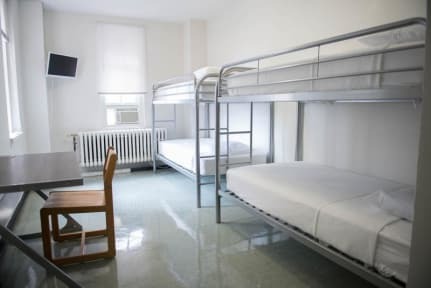 The guest rooms at the West Side YMCA Hostel are private single and double rooms (with either single or bunk beds). Each guest room has a TV, Air conditioner and include Linens and towels. Shared bathrooms are in the hall but guests also have access to locker room facilities. A 24-hour security desk, means that guests can check in overnight and are free to come and go without worrying about a curfew. The onsite shop is open from 8:00 am – 7:00 pm for a quick bit to eat or a hot cup of coffee. In the heart of the Upper West Side, we are 3 blocks away from the Columbus Circle transit hub, Times Square and the Empire State Building are a quick 10 minutes away by subway, while Central Park is across the street. Jazz at Lincoln Center is blocks away and The American Museum of Natural History is a 15 minute subway ride. If shopping is your goal, the Time Warner Building hosts the Shops at Columbus Circle which include Sephora, Hugo Boss, J. Crew, H&M, William & Sonoma, Armani Exchange, Microsoft Store, Bebe and Coach to name a few.